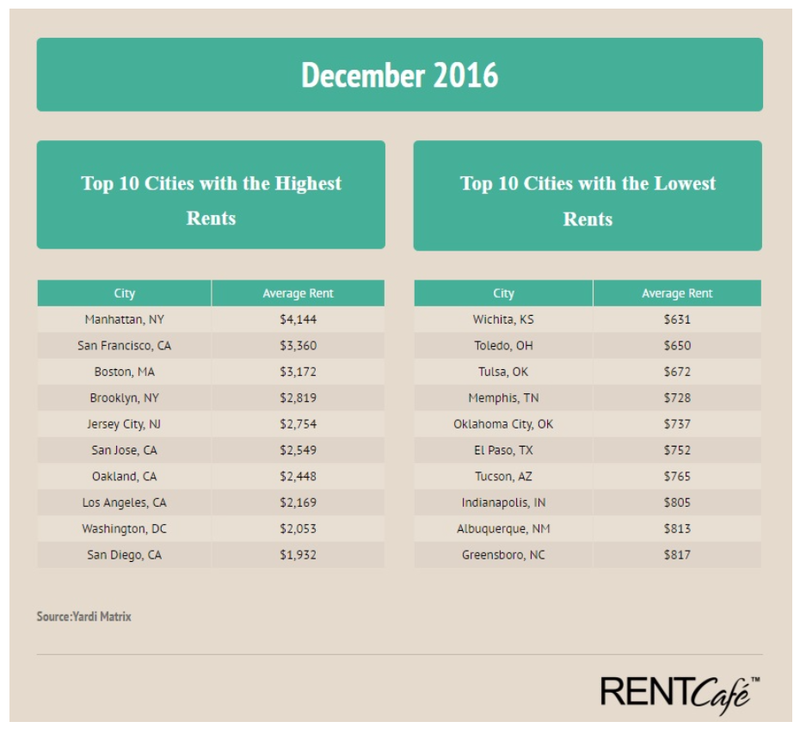 recent report from U.S. apartment search website RENTCafé, rents have finally started to cool off and December was the fourth straight month to witness a downward trend with a $4 drop, which brought the national average rent to $1,210. One-bedroom apartments saw the most substantial dip, as rates dropped 0.4%, followed by two-bedrooms (-0.2%), while studios and three-bedroom units both saw a -0.1% decrease. This respite was mostly the result of intensified construction activity; the number of new developments grew by 50% in 2016 compared to the previous year (320,000 new units came online in 2016 vs. 200,000 units in 2015). 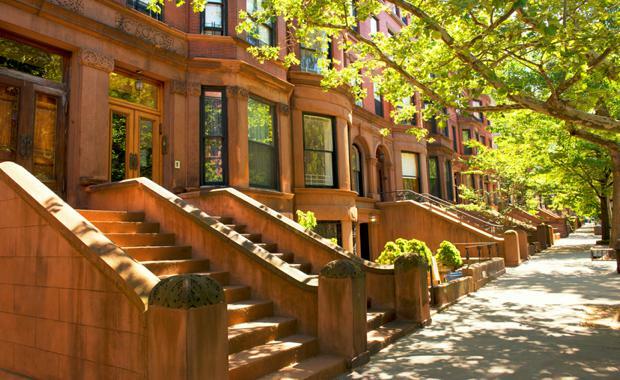 However, on a year-over-year basis, rents expanded by 4% nationwide, according to research firm Yardi Matrix. This number rests well above the 2.3% long-term (8-year) average. Renters across the US now experience very different situations: while residents of San Francisco, San Jose, and Houston may find that this is the best time to rent, with rent growth at minimal levels and even free incentives on the table, other renters are not as lucky this time of the year. Following the recession, many people started to look at homeownership with different, more cautious eyes. This is one of the main reasons renting is gaining traction; and with the promise of shorter commutes, great amenities, and low-maintenance, mortgage-free housing in sight, even those who actually can afford to buy homes are choosing to rent instead. According to RENTCafé, the number of renter households making over $150,000 per year has more than tripled over the last decade, going from approximately 551,000 in 2005 to 1.75 million in 2015. The growing demand for luxury apartments led to developers building more high-end apartment communities: in 2015, 75% of all large-scale rental developments were categorised as luxury, only to reach 80% in 2016. 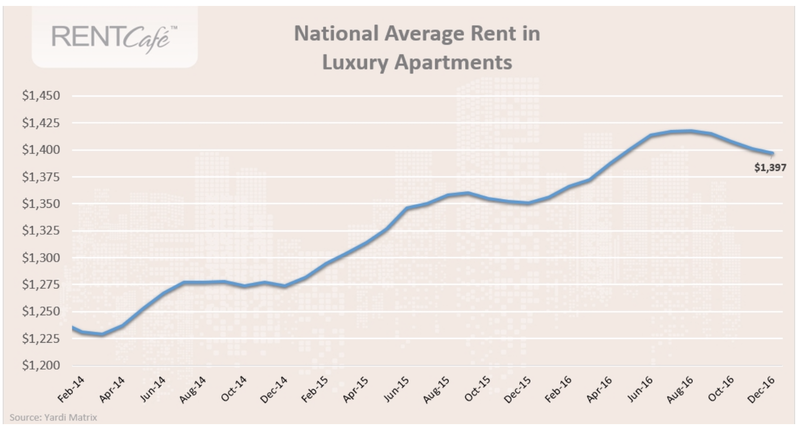 Prompted by the high number of new completions, the average rent for luxury apartments has been on a very gradual downward slope for the last 4 months, reaching $1,397 in December. 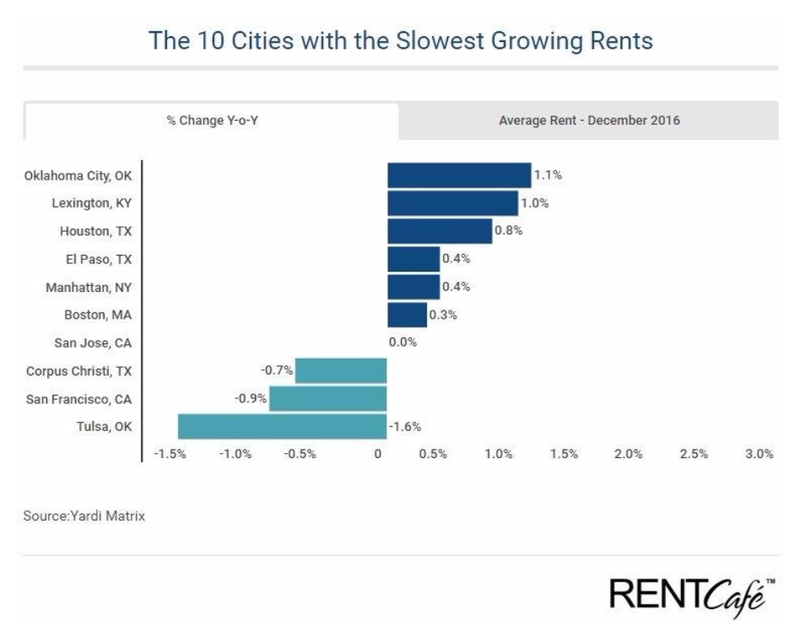 Though the presence of Tulsa, Corpus Christi, and El Paso on the list of cities with the slowest rent growth isn’t much of a surprise, the good news is that historically tight markets such as NYC, San Francisco, and Boston also made the cut. Houston saw a mere 0.8% increase y-o- y, while rents in San Francisco actually went down by almost 1% from the same period in 2015. 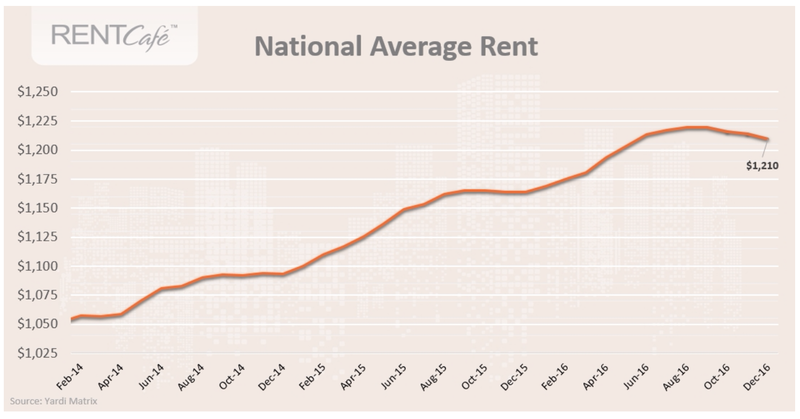 However positive though, this bit of good news is where December bliss ends, especially for renters in cities where rent growth is two or even three times the national average. Two California cities, namely Sacramento and Stockton, together with Colorado Springs, lead the nation with double-digit spikes: 12.2%, 10.6%, and 10%, respectively. Detroit (9.3%), Mesa (9.1%), and Long Beach (9%) follow suit and the list is closed by Los Angeles, with a 5.7% increase. Although the number of new developments has been on an upward path, softening rent growth in many cities in the process, affordability continues to be a pain point in larger markets. 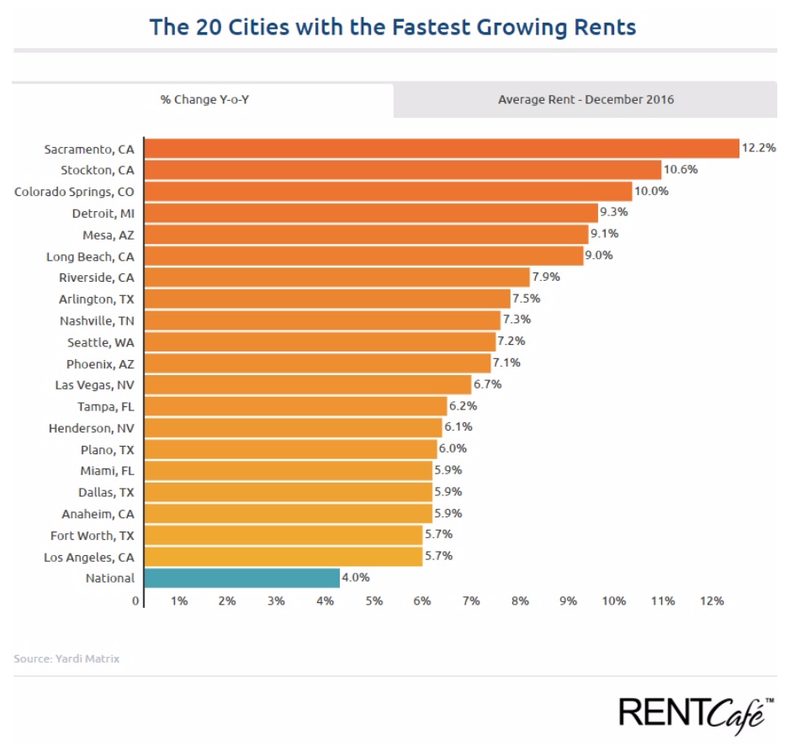 New York City, San Francisco, and Boston remain the top 3 cities leading the nation in terms of rental rates. San Diego is the only one among the top 10 cities with the highest rents where the average rate is below $2,000 – Manhattan tops that list with an average rent of $4,144. On the other end of the spectrum, we have Wichita, Toledo, Tulsa, Tucson and Greensboro – with rental rates hovering between $631 and $817, more “down to earth” prices representative of the Midwest.